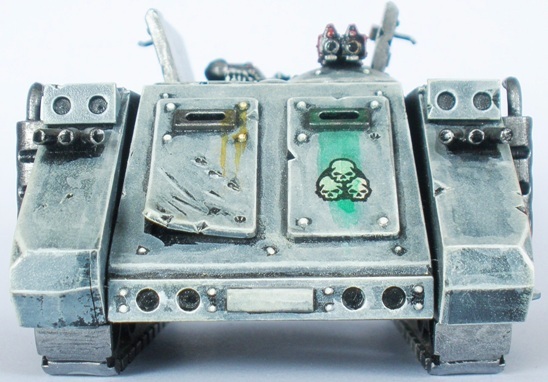 Space Marines (and Chaos SMs) should always have a few Rhino APCs in my opinion. Regardless of whatever is in vogue in terms of army selection for games, a mechanised column of Marines is just a cool image I think. My Sin Eaters ended up with three Rhinos, the first of which is here. 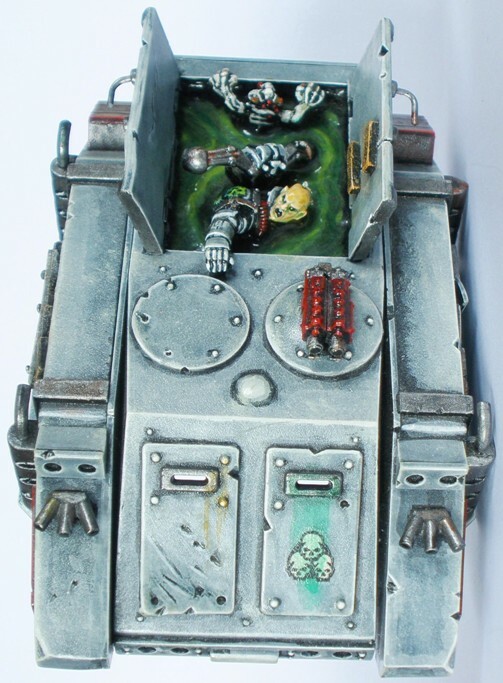 This Rhino was usually used to transport a Squad of Plague Marines. 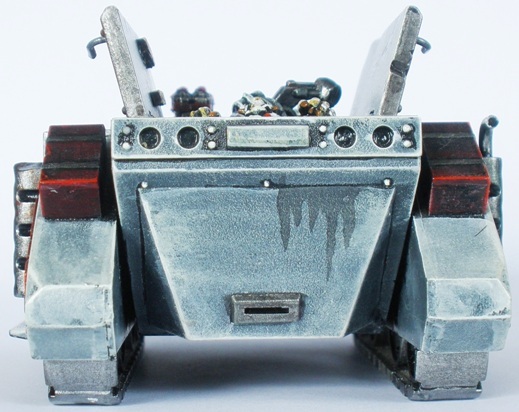 This was the second Rhino that I assembled and subsequently become known as the “jacuzzi rhino”. 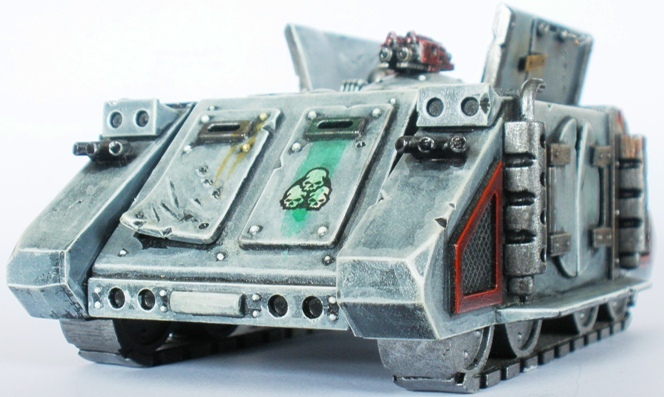 While I still like the first Rhino that I put together (photos to follow eventually) it was pretty austere by the standards of most Chaos vehicles. 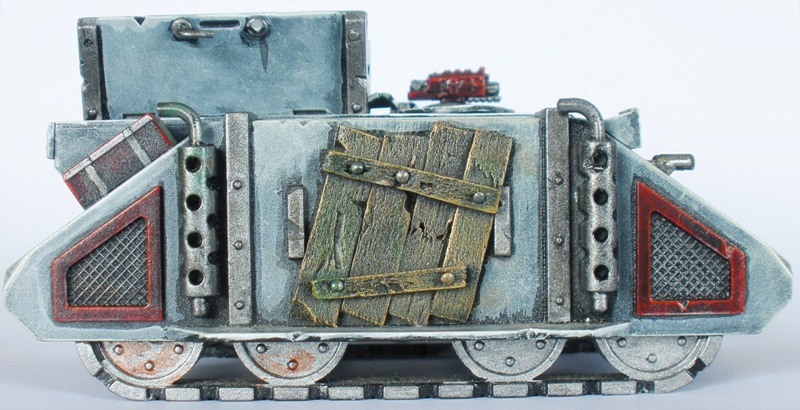 Although I deliberately played down much of the more baroque aesthetic that tends to be ladled all over most Chaos armies that I have ever seen, I did get a little carried away with this vehicle in particular. In fact as the army went on everything got more baroque really. Still, I dont think that it looks as silly as the myriad of vulgarly overburdened Chaos armies out there. Many are so covered in spikes and skulls and impaled bodies etc that the shapes of the models get so indistinct as to ruin the entire look. IMO, naturally. 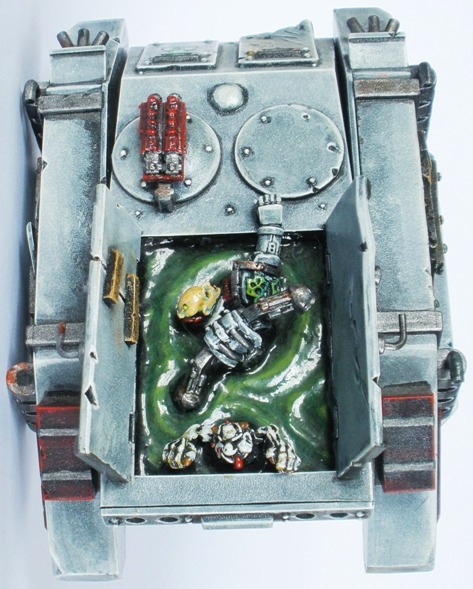 The concept for this vehicle is silly but sort of fun: Nurgle is synonymous with corruption, illness, rot and bodily fluids and so I decided to make the tank look like it is filled with snot. A very adult approach I am sure you will agree. When putting together an army for whatever reason it is important to have a few centrepieces. 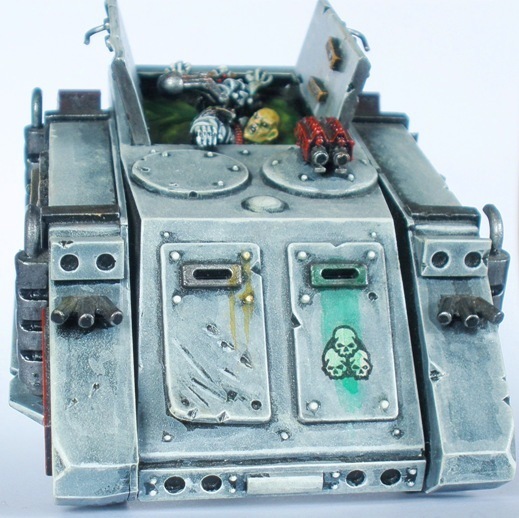 Personally for armies I think that usually the most important thing is a sense of uniformity in the colour scheme. That can lead potentially too uniform / potentially bland overall look and so it is important to have a few things that draw the eye. While the conversion of this Rhino was not particularly difficult to do it has over the years probably been the one thing that most observers point out in the army. A few figures that I am quite fond of to start 2010. 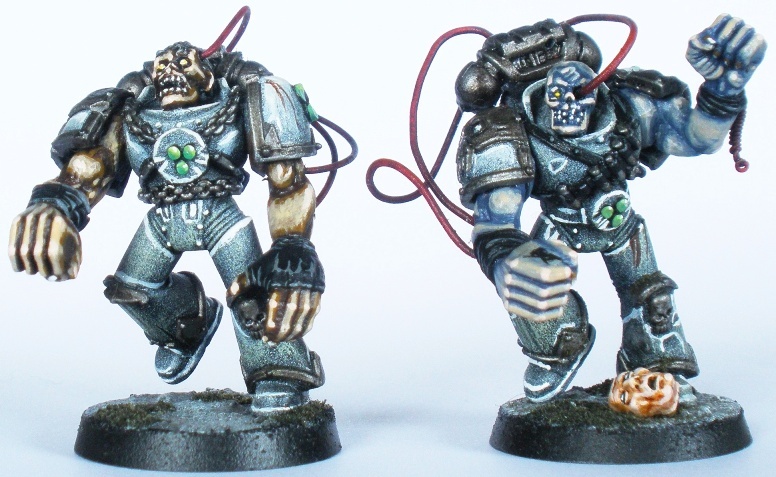 Squad Nemesis was assembled and painted up for use as a Possessed unit in my Sin Eater Chaos Space Marine force back in 2000. 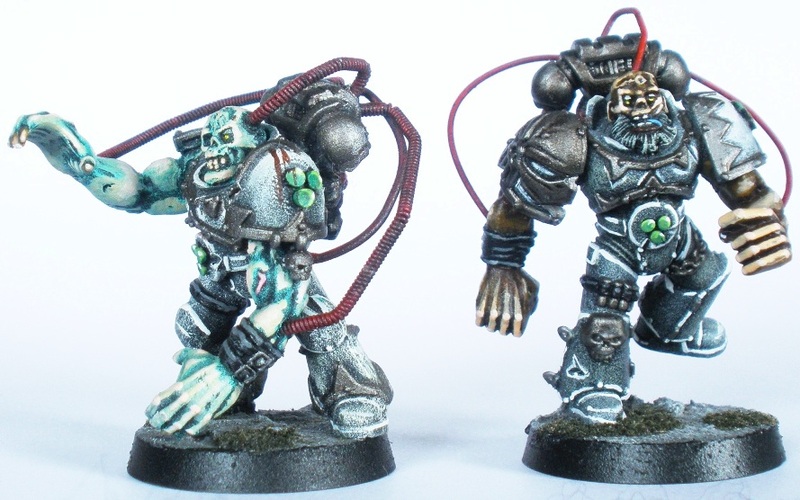 GW didn’t make possessed Chaos Space Marine figures at the time (although a lot of their original Chaos Renegade marines from the 80s were very suitable. I also painted up a unit of those guys for the Sin Eaters, of which there will be photos at a later date) although the Chaos Mutation sprue came out around then. 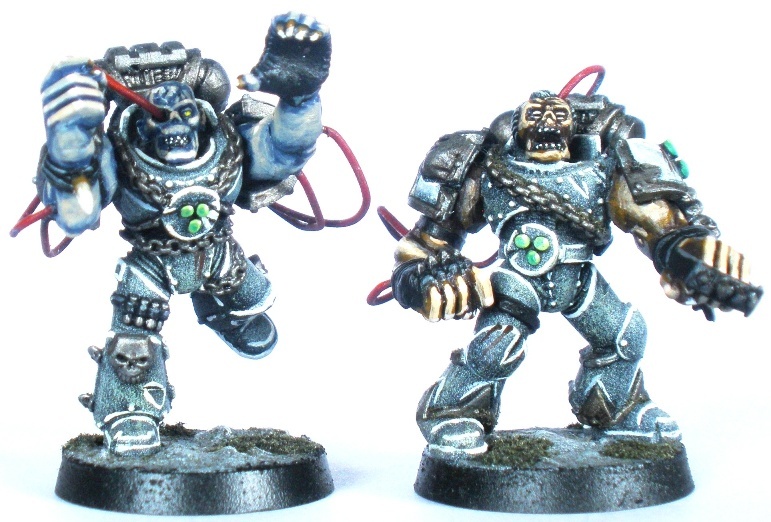 Subsequently GW made specific metal possessed marines who looked a little like the Mordheim possessed if I remember correctly. Anyway, I wasn’t that keen on the possessed figures that I had seen up to that point: they were usually predictably heavy on the tentacles and bat wings etc and low on interest factor (to me at least). With that in mind when I got around to making my own I tried to steer a little to the left of the usual fare. Unsurprisingly I used Resident Evil as an inspiration and starting point. Bloated with Dark Energies. WooOOOoo. I prefer “science” zombies to “magic” zombies and I have liked the Tyrant style super-zombies from Resident Evil since I first saw them. Therefore they were a big influence on what I wanted my Possessed to look like. Although trying to avoid the idea of magic-y things in the context of an army that supposedly represents worshippers of Dark Gods who receive direct aid from their patrons might sound perverse, I did have a few reasons to do so. Mainly, the urge to have something slightly different from what I had seen already was one. 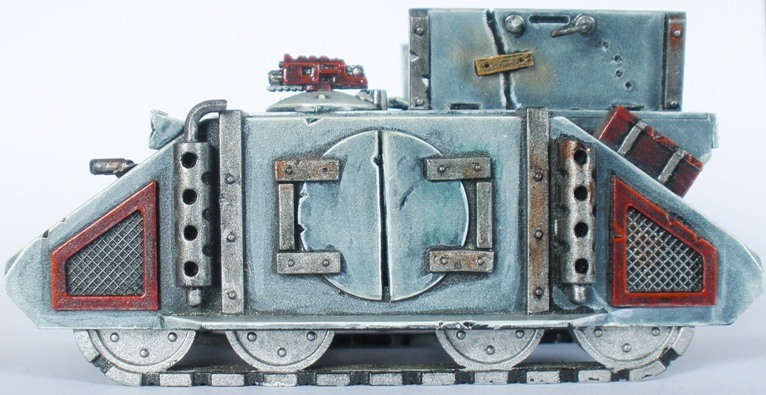 This was also influenced by the background of the Chaos Space marines from that era. Before then the Chaos Space Marines were regularly portrayed as mindless devotees to their own cults. A couple of things about this make them less interesting to me: firstly that I don’t like religion and in particular mindless people with a lot of “faith” and secondly the idea of Chaos Marines who are already completely under the thumb of their patron suggests weakness. Part of the suggested background for the Chaos Marines at this time was that the different Legions were actually more in a marriage of convenience with their patrons and that the Marines therefore had their own agenda and goals. This interested me a lot more that another bunch of frothing jihad types. 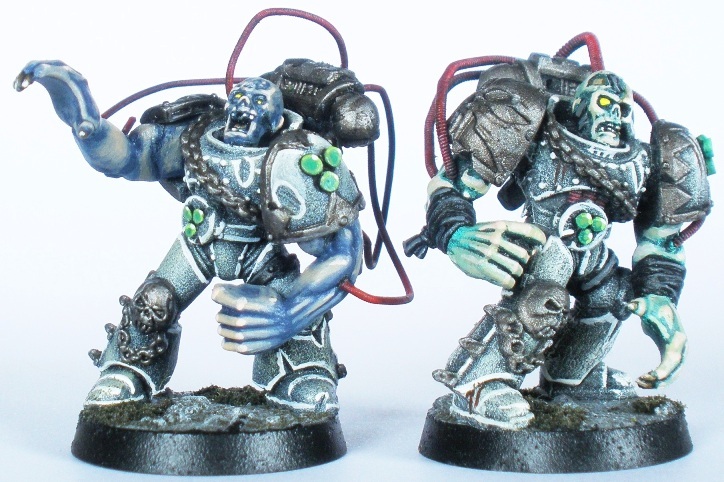 So Squad Nemesis was intended to be a group of (relatively) sane Chaos Marines who use pseudo-scientific means to either augment themselves with physical mutations on a temporary basis or use the pseudo-science to temporarily become a host for whatever daemonic energies were doing the rounds. So I went with a look that involved a lot of cables coming out of the marines backpacks into their bloated and deformed bodies: a little more science than magic. I think it worked and of the units in my Sin Eater force Squad Nemesis is one of my favourites. The parts used were Ork arms, zombie heads and guitar strings. The guitar strings didn’t keep their shape as well as I hoped which meant that they had to be kinked into shape rather than curved. I would have rather that they were curved but I got over it. Happy New Year and all that jazz!